On Saturday 23rd November Amy Berman, who has the blog Grumblings from a Greedy Girl, is hosting a Thanksgiving Party in Tooting. Lots of things to look forward to there, including cocktails, music, and of course a Thanksgiving Day dinner with all the favourites, but with a playful interpretation. 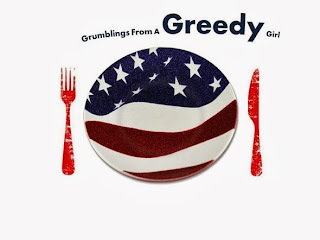 "This month, Grumblings From A Greedy Girl (www.grumblingsfromagreedygirl.blogspot.com) will host a very special American Thanksgiving pop-up evening in Tooting Market. Alongside the team behind the sell-out Mexican and Filipino events, this pop-up will offer guests the excessive, outrageous generosity that the States are synonymous with in a unique and exciting setting – just in time for the holiday season! The menu, designed and prepared on the night by Amy Berman, the driving force behind Grumblings From A Greedy Girl, takes inspiration from the traditional feast, but with a more playful interpretation. Guests will begin the autumn banquet with warming bowlfuls of unctuous Sweet Potato Soup topped with floating Salted Chilli Marshmallows. The main event will see a festive Turkey and Cranberry Burger sitting atop a Cornbread Bun, adorned with Sausage Stuffing and Cranberry Sauce. If that wasn’t enough, Macaroni and Cheese will be served on the side, along with daring Buffalo Green Bean Fries. The desserts come courtesy of another American force to be reckoned with, The Yummy Yank (http://www.theyummyyank.co.uk/), who will be offering the finest in stateside desserts; nutty and sweet Pecan Pie Bars and Pumpkin, Chocolate, Chilli Bars for those who like to end the evening with a kick. With American-inspired cocktails and music playing for the duration, along with a host of entertainment and games, including Man v. Food style challenges, the pop-up promises to deliver only the finest in stateside hospitality. The charming Bindlesticks bar in the heart of this historic market will also be open serving an array of drinks!"